By Michael A. Tall, M.D. This 11-year-old male presented to the Emergency Department with severe pain and inability to use his right arm after falling during a soccer game. 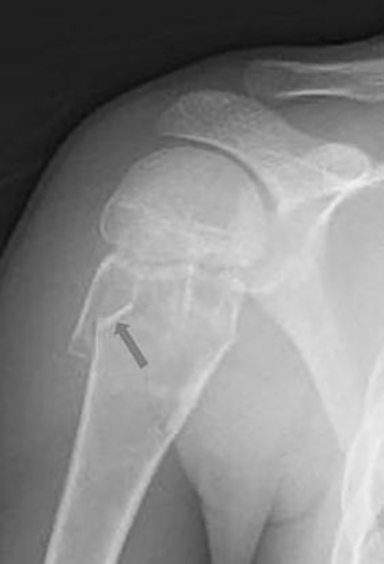 The figure shows a lytic lesion in the proximal metaphysis of the humerus in a skeletally immature patient with a narrow zone of transition. There is a “fallen fragment” (arrow) located dependently, which is characteristic of a pathological fracture through a unicameral bone cyst (UBC). UBCs are benign, non-neoplastic bony lesions, also referred to as simple bone cysts. They occur in the metaphysis of long bones and are most common in the proximal humerus, followed by the proximal femur. The exact etiology of the lesions remains unclear. Lesions are most often detected incidentally on imaging. Occasionally, patients may present with a pathological fracture through the lesion as a result of weakening of the bone. UBCs typically heal when patients reach skeletal maturity. As such, physicians avoid treating these lesions whenever possible. The lesions often spontaneously resolve as a result of subsequent healing after fracture. Surgical treatment is sometimes necessary for larger lesions to prevent development or recurrence of a pathological fracture. Tall MA. At the Viewbox: Unicameral Bone Cyst with Fallen Fragment. J Am Osteopath Coll Radiol. 2012;1(2):39. Dr. Tall works with the Department of Diagnostic Imaging, Wilford Hall Ambulatory Surgical Center, San Antonio, TX.